As head of Scotland Yard’s Counter Terrorism Command between 2011 and 2016, I looked in some depth at the threat posed by drones during the London 2012 Olympic Games. It was clear to us then that it was one of the potential scenarios we faced — for instance a Fathers 4 Justice drone coming into the stadium. A comprehensive report by the Combating Terrorism Center in the United States set out in 2016 how drones have been used in the terrorist context for a number of years, including by the Hizbullah and the Islamic State. At the time when the report was published, I had said that this has to be one of the biggest concerns for the West, because sooner or later, terrorists will use it here. It was always a question of when,not if. But drones are a very difficult threat in a civilian context, and there is sadly no foolproof solution. In relation to this, many people are asking this question: Why the drone can’t just be shot down? Unfortunately, it’s not that straightforward. If a marksman were to shoot a drone down and its debris were to kill someone, potentially the officer could then face a manslaughter charge. Over a runway, of course, the chances of it landing on anybody are remote but you’ve still got the challenge of a marksman hitting such a fast-moving object, which is not easy. Jamming electronic signals works in some cases but that’s not always the case. It would also jam everything else in the vicinity. There are also net systems that can catch and immobilise drones, which, however, depends on being in proximity to them. These difficulties aside, the Government should have been much more vigilant to this threat. Clearly, for example, there needs to be more effective deterrents. A five-year prison sentence for endangering aircraft or breaching the restrictions on operating drones is not enough. It should be a 20-year sentence. Those who use drones for malicious purposes need to know that they are going to be hit hard with lengthy jail sentences. The Civil Aviation Authority (CAA) itself admitted that rules and regulations around drone use are ‘evolving’ but this is the state of play at the moment: Drones are classified as “unmanned aircraft.” The CAA was keen to point out that they are most certainly a type of aircraft and “not toys.” This, because lands managed for public enjoyment and biodiversity are not appropriate places for their use. There are concerns, too, that the legal 50m distance and full control cannot be guaranteed. If your drone weighs over 20kg then it’s only legal to use it in certified “danger areas” such as Parc Aberporth aerodrome in West Wales. Those using a drone weighing less than 20kg for commercial use — receiving payment of any sort — are required to seek permission from the CAA. To get permission, you will have to show that you are “sufficiently competent”. This is less clear-cut than for manned aircraft, where there is a well-established licensing procedure. If your drone is under 20kg and you’re not using it for commercial reasons, you still have some rules to follow. i) Anyone filming with a drone for their own purposes must avoid flying it within 150 metres of a congested area and 50 metres of a person, vessel, vehicle or structure not under the control of the pilot. ii) You will also need to fly the aircraft within sight. This means you can’t go above 400ft in altitude or further than 500 metres horizontally. If you want to exceed that limit, you’ll again need to seek explicit permission from the CAA. I also know that pilots have been asking for a five kilometre exclusion zone for drones around airports. They should have been given that. It was too long before the drone flying above Gatwick was seen as a national major incident and treated accordingly, and it was too long before the Whitehall machine got involved. If a drone is near any critical national infrastructure, it should be treated as a major incident. I’m surprised there wasn’t a ministerial Cobra meeting within six hours. From the outset, it was clear that it would cause chaos. 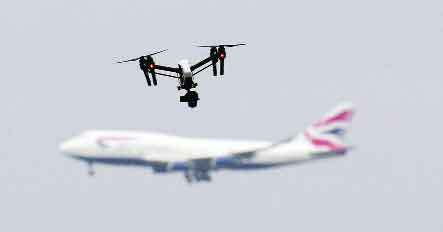 Two people have been arrested in connection with the criminal use of drones which has caused widespread disruption to flights at the Gatwick Airport. Sussex Police said the people were arrested just after 10pm on the night of December 21. Superintendent James Collis of Sussex Police said: “Our investigations are still ongoing, and our activities at the airport continue to build resilience to detect and mitigate further incursions from drones by deploying a range of tactics. No more details about the suspects were released. Anyone with any information was asked to call and cooperate with the police. Unfortunately, we are now likely to see ‘copycat’ incidents. And the ease with which a major UK aviation hub was brought to a standstill will not have escaped the attention of terrorist groups who will be wondering, Why they have not tried using drones before? Ministers who are scrambling to protect Britain against potential “copy-cats” drone attacks fear that the chaos at Gatwick could be replicated at other transport hubs across the country. Whitehall sources said the authorities were “very concerned” about attempts to repeat the paralysis at Britain’s second busiest airport, which saw around 140,000 passengers delayed, and were taking urgent steps to safeguard others against the threat. This is not just an airport issue, it is a threat issue which needs to be seen in the broadest context. There is little in place to stop these drones from being flown over Downing Street or Buckingham Palace or other highly sensitive areas. Also, they can be used to drop anything from great heights, including explosives.We saw a chaotic response to this incident because drones are a relatively a new threat and no single organisation believes that it is their responsibility to respond to the threat they pose. When something like this happens, where hundreds of thousands of people are affected, there is a lot of serious economic damage. No one has died as a result but there is a huge amount of impact on the nation. It’s a serious major incident, which was unfortunately not treated as such.